Perennial herb, up to 2m high, native from South China to Indonesia, cultivated throughout Southeast Asia; rhizomes tuberous; leaves oblong or lanceolate, up to 35cm long; flowers green-white, fragrant; fruits red. „… essential oil was prepared in a low yield (0.04-0.15%,) by steam distillation of fresh, comminuted rhizomes… Alternatively, the essential oil was isolated by extraction of the steam distillate with dichloromethane. In a third preparation, dried, finely milled rhizomes were submitted to steam distillation and the oil was extracted with dichloromethane (yield 0.4%).“ Main components of the essential oil were 1,8-cineole (58% fresh, 24% dried rhizome) and trans-β-farnesene (8%, 30% resp.). Other monoterpenes were e.g. 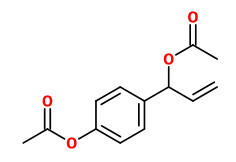 4-terpineol (2%/7%) and α-terpineol (2%/0.8%). Methyleugenol, eugenol acetate, chavicol (4-allylphenol) and chavicol acetate were also present together with unidentified substances with woody and incense-like odor. Camphor and methyl cinnamate was not found. There were far more volatile constituents found in fresh than in dried rhizome. Dried sliced rhizomes of A.galanga contained 1.5% of acetoxychavicol acetate, which was active against seven dermatophytes. MIC values ranged from 50 to 250 microg/ml. The compound was not found in rhizomes of A.officinarum, Zingiber officinale and Kaempferia galanga. The acetone and ethanolic extracts of A.galanga were active in axenic (aerobic and anaerobic) and intracellular assays to determine the antimycobacterial potential. The aqueous extract did not demonstrate activity under the defined assay parameters. All three extract contained acetoxychavicol acetate.